The Meals on Wheels program is one of the largest care programs for vulnerable Americans in the country. Food insecurity, a term used to describe the condition of need that results from poor health or poverty, continues to be a concern in the United States. Millions of seniors with a limited income who are in poor health and/or who are without regular care from family members rely on home delivery food programs like Meals on Wheels to provide balanced meals and a friendly face visiting from time to time. Senior hunger is an important issue that not only has an impact on the affected person's overall health, but according to the Meals on Wheels Association of America, it also has a direct bearing on the person's ability to perform Activities of Daily Living (ADL), such as walking, bathing and dressing independently. In order to combat these detrimental effects of undernourishment, the program delivers meals in many areas of the country. To find a local deliverer, and to apply to have meals delivered to yourself or to an elderly loved one, the Meals on Wheels website is a good place to start. Use the organization's online Find a Meal feature to search for meal programs by state, city or organization name. If you would rather inquire about possibilities by telephone, call Eldercare Locator at (800) 677-1116. MealCall.org is another online resource for finding nutritious meals for seniors. The organization's website includes information about local food programs for seniors, including ones that deliver food to clients in their homes. The site also provides information about congregate meal programs offered by churches and community organizations. Visitors are invited to search for local programs in their area; if no program can be located in a particular city or town, Internet users can use the search function to find a program near them. 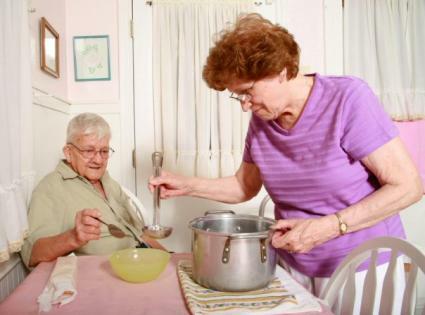 Along with the United States, Meals on Wheels services are available to people living in Canada, the United Kingdom and Australia. Specific programs tend to be community based, although some of the ones serving clients in the United States receive federal funding. The types of meals offered by each chapter vary. Some programs deliver hot meals to seniors, while others offer prepared meals that are microwave-ready. A third meal option offered by some Meals on Wheels organization is frozen foods. Meals may be delivered by paid drivers or volunteers. A client can look forward to receiving three or more meals per week. Federally-funded program services include a safety check on the client with each visit, and seniors receiving this service look forward to seeing a friendly face on a regular basis. Most people who receive assistance from Meals on Wheels are seniors, but this service is also available to those who are ill or recovering from surgery. Some people who access this service are living with a chronic illness, such as Multiple Sclerosis, and need help with meals during times when the disease flares up. In the U.S., meal programs receiving federal funding may only offer services to clients who are 60 years of age or older. Some clients contribute to the cost of the meals on a voluntary basis; other meal programs ask that clients pay a nominal amount toward the cost of the food. In Canada, Meals on Wheels programs are run at the local level. The type of service and eligibility requirements vary, depending on the source and level of funding available. Visitors to the Canadian senior program section on the MealCall.org website can search for local organizations by choosing their province and the closest city or town. The results indicate whether meal delivery services are available, as well as contact information for specific providers. United Kingdom residents can find information about meals at home services by visiting the Direct.gov.uk website. People who are interested in receiving meals at home must be assessed by the social services department associated with their local council. The client pays a fee to receive meal deliveries and in most cases, frozen food is delivered to the recipient. Hot meal deliveries can be arranged for clients who are unable to heat up a meal for themselves. In Australia, clients also pay a fee for the meals they receive. The exact amount varies, depending on the state, but the food is provided to recipients at cost. Volunteers prepare and deliver the meals, which helps to keep costs down. Elderly or disabled residents and their caregivers can be referred to the program or individuals can contact the local agency to request an intake interview. 2.5 million seniors were at risk for hunger in 2007 and 750,000 people went hungry because of a lack of funds. Senior hunger is not solely a problem affecting minorities. Over 66 percent of hungry seniors are Caucasian. By the year 2025, 9.5 million seniors in the United States will be at risk for some type of food insecurity. The number of American seniors at risk for hunger will be approximately 3.9 million by the year 2025. Meals on Wheels offers nutrition and companionship to seniors and other vulnerable members of the population. This service may be provided on an as-needed, short-term or long-term basis, depending on the individual's particular needs.